The tranquil town of Manipal, in southern Karnataka, has come to be known as the ‘university town’ or ‘campus town’ by locals. Students from all over the world flock to Manipal Academy of Higher Education (MAHE) to pursue their higher studies. In over 60 years since its inception, MAHE graduates have been championing every field, from medicine to management. So, when a student joins Welcomgroup Graduate School of Hotel Administration (WGSHA), MAHE—the birthplace of India’s first degree in hotel management—naturally, they expect the best. A collaboration between MAHE and ITC’s Welcomgroup has made sure these young men and women get what they come for, and more. At the end of their time at the flagship Bachelor of Hotel Management (BHM) programme which was offered as early as 1986, students walk away with a degree from MAHE, an Advanced Diploma Skills Certification from City & Guild, Wine Fundamental Certificate Level 1 & 2, and MOOCs (Massive Open Online Courses). They are ready to become leaders in the hospitality sector across the globe. WGSHA has consistently been ranked among the top two hotel management institutes in India, and recently bagged the 30th rank in the world in a listing by CEOWorld Magazine. “The best part about being in a college like WGSHA is that you get to learn all the necessary skills required for the hospitality sector while being part of a university environment. Every day poses a new challenge, whether it be hosting hoteliers who have come for campus placements or conducting a food festival with over 300 attendees,” says Mohini Mohandas, final year BHM student. Mohini is currently working as a Marketing Intern at Radisson Blu Plaza Hyderabad. A six-month compulsory internship at national and international properties in the final year of the BHM programme ensures students are prepared to meet the rigorous challenges of the hospitality industry. The WGSHA building adjoins Fortune Inn Valley View, where students are sent for training in the various departments. Getting hands-on with learning throughout the academic year is a unique opportunity for WGSHA students as it gives the an idea of what goes on in the hospitality sector. As WGSHA celebrated its Silver Jubilee in 2011, the institute launched a B.A. Culinary Arts programme. “The course was really interesting because the curriculum explored topics like food sociology and anthropology, accounting, food photography, food styling—there was much more to food than the kitchen,” says Elizabeth Yorke, who graduated as part of the first batch in 2014. Elizabeth regularly travels to different countries and has attended various culinary educational programmes and symposiums at the likes of Oxford and Yale, between working in hotels, restaurants and with some iconic figures in the food scene worldwide. Elizabeth’s globe trotting journey is an inspiration to young culinary enthusiasts today, and an ode to the exposure WGSHA provides its talented young students. The curriculum is benchmarked with the best institutes worldwide. International internship opportunities and exchange programmes have opened doors for students like never before. The institute also facilitates credit-transfers to foreign universities. WGSHA’s reputation as one of India’s premier hotel management institutes precedes itself, which means students are well-received across the globe. But it is not recognition alone that sets apart these students, who find it easy to excel wherever they go. It is the international certifications and world-class training that underpins their competency. 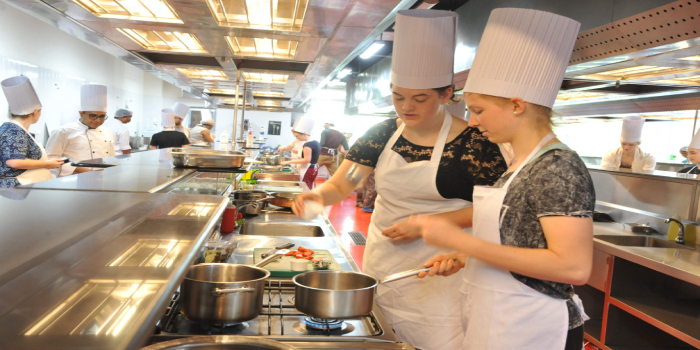 Culinary students at WGSHA are also encouraged to go back to their roots and explore regional cuisine. Students are on a quest to bring out hidden recipes and put the rich heritage of Indian cuisine on the world map. Interestingly, classrooms and kitchens at the Department of Culinary Arts have Sanskrit or Hindi names like ‘Shiksha’, ‘Prayog’ and ‘Mithai’, which mean ‘learning’, ‘experiment’ and ‘sweets’. Students also get a chance to enjoy Manipal’s own eateries, all the while learning how to critique and understand local flavours. “WGSHA organizes numerous activities throughout each semester, including talks, discussions, food festivals, cultural events, festivals etc. There is not a day in a student’s life where they can’t find anything to do,” says Mohini. One of the most unique features at WGSHA is the Museum of Culinary Arts inaugurated earlier this year. From 100-year old ladles used to serve food at Indian temples to pots, pans and a plethora of items from Kashmir to Kanyakumari, the museum houses thousands of unique items that bring out the rich culinary heritage of India. Research is an integral part of any good academic curriculum, and hotel management or culinary arts is no different. Research projects are mandatory for all students at MAHE. BHM students take up core operational areas, but things get interesting in the culinary department. From idlis to low glycaemic-index thalis and diabetic cookies, faculty and students work together to uncover the secrets and science of food. While WGSHA students are heading out to bright futures and lucrative careers in the top hotels of the country, they remain grounded with the realities of rural India. The institute fosters an attitude of creating impact in society through its social outreach programmes. Students get a chance to implement their learning outcomes in rural settings. Dietetics students visit anganwadis and help develop low-cost recipes. Others have adopted villages and come up with innovative ways to use local resources to generate revenue. Yet others have taken up women’s empowerment as their cause. There is an opportunity for growth around every corner at MAHE. The academy is setting up an Idea Café on campus—a place where students from all disciplines are welcome to sit down, brainstorm, and come up with exciting ideas and innovations. Interesting concepts will receive seed funding. While others ideate, WGSHA students will set up a café to make sure there is fire—and great food—in their bellies. They too, will receive base funding, and have to come up with a plan to increase their sales and pull in profits. Michelin-starred Chef Vikas Khanna is an award-winning author, restauranteur and has famously judged MasterChef India. Chef Thomas Zacharias won ‘The Best Chef of the Year Award 2017’. Varun Mohan, who works at The Hyatt, Bengaluru, is one of the youngest General Managers in the country. Sahil Ranaut is among the best Revenue Managers around. Neha Garg runs Red Kite Consulting, a top placement agency for luxury hospitality. Each are leaders in their fields, and they all have one thing in common—a degree from WGSThe WGSHA building adjoins Fortune Inn Valley View, where students are sent for training in the various departments. Getting hands-on with learning throughout the academic year is a unique opportunity for WGSHA studentsHA. The now 32-year old institute has been the launch-pad for some of the biggest names in the hospitality and culinary spheres, and the strong alumni connect is what drives further growth. Careers360 brings here an interview with chef K. Thirugnanasambantham, who is the Head of Department of Culinary Arts, MAHE. Q. WGSHA has a long legacy as a leading hotel management institute. What has made this possible? A. The collaboration between ITC and MAHE has been a major strength in maintaining the standard of education over the years—one is an expert in the industry, and the other in academics. ITC’s role is to benchmark curriculum, exchange expertise, develop programmes and give industry insights to groom budding hospitality professionals. Our team of faculty members and leadership is excellent. Besides, our alumni contribution worldwide has helped us sustain. Q. How has curriculum kept pace with changes in the hospitality industry? A. We believe industry academia collaboration is very important. Our job is to give students the fundamentals, and also tell them what is likely to happen in future. That is where our strong collaboration with industry comes into play—we invite industry experts and leading academics across India and abroad to give inputs to our students. Our faculty members are abreast with new trends and technologies, and we ensure students get the necessary hands-on training. Q. What edge does a WGSHA graduate have in the industry? A. When students spend 3-4 years here, the idea is to not only put them through structured curriculum, but we also look into overall development. We want our students to be complete personalities who can fit into not only the core areas of hospitality and culinary, but be leaders wherever they are. In the university set-up at MAHE, students get a chance to interact with other disciplines. A lot of collaborative learning happens. We also give a lot of emphasis on outside classroom learning like field trips, food festivals, simulations and CSR activities. Q. What is your advice to high school students? A. You need to have passion and the right attitude. I would tell youngsters not to get tempted by media. The reality is very different. Someone who wants to pursue hotel management or culinary arts should take the time to come, sit in a class at an institute, get a feel of what to expect, go, see the industry, then decide if you’re fit for it. Your Welcomgroup Graduate School of Hotel Administration, Manipal University, Manipal brochure has been successfully mailed to your registered email id .